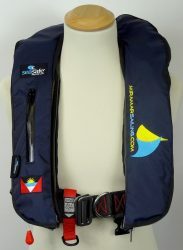 Please Note: We are not able to offer this course at Miramar Sailing School, but can arrange for it to be taken as the equivalent STCW Personal Survival Techniques one day course as an individual module within the STCW 10 at our associate MCA Training Centre in Antigua. STCW courses are held regularly, and usually start on the first Monday of each month. The PST module takes place on the Friday. 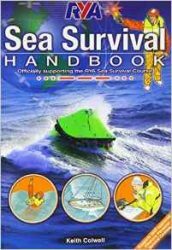 This course gives you the introduction of what to do should you ever need to abandon ship and take to the liferaft. The course covers basic survival afloat, what to take with you, and how best to survive whilst awaiting rescue. 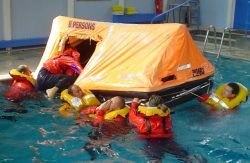 The practical part of the course takes place in the pool where you will don a lifejacket and practice your skills getting in and out of the liferaft. You will be required to wear your swim suit, shorts and T shirt or track suit bottoms whilst completing the pool session. Please bring a towel. The aim of this course is to give an understanding of how to use the safety equipment carried on small boats, including a practical session in launching and boarding a life raft. The course is recommended by the RYA & MCA. Course Duration: 09:00 – 17:30 including a 2 hour practical session in the water. Please bring a towel. Availability: As part of the STCW course held monthly between November and May. This course can be taken as an individual module. Discounts: are not available for this course.